Playmation Studios is developing Serious Games for language learning with an innovative game mechanic. Driven by their passion for languages and their frustration with the traditional methods, the brother and sister team Jen and Justin Helms have decided to focus their first games on foreign language learning. With the value proposition of creating a new way to learn foreign languages, their novel approach is based on a language puzzle mechanic made possible by a robust natural language generation platform they have developed. The result is an immersive game – Stagecraft for the iPhone and iPad - that allows players to experience how words, pictures, sounds, and grammar all fit together in the target language (TL), via sandbox style language puzzles that must be solved. Targeting 8 year olds and up, Stagecraft is intended to be a supplement for formal classroom learning. It costs $1.99 to download and that includes 4 puzzle sets with associated practice challenges for both reading and listening comprehension. Players can then upgrade to unlock an additional 8 puzzle sets for $3.99. Spanish and French Stagecraft are available now on the App Store! English, Italian, and Chinese coming soon. 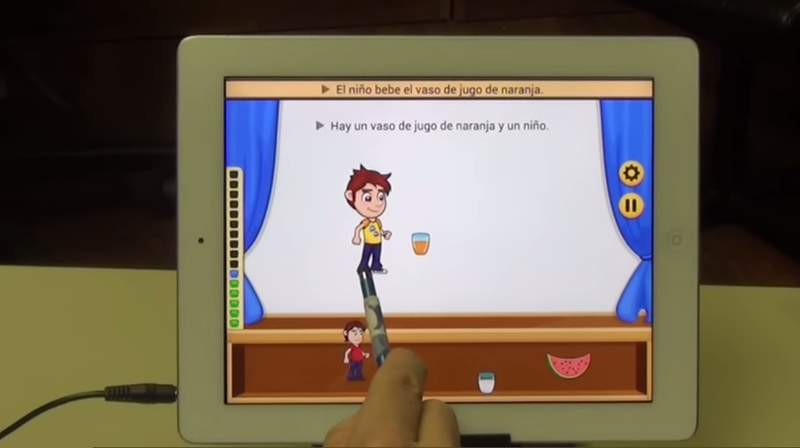 Please find how Stagecraft language learning games work at YouTube Channel Children's Technology Review- Spanish Stagecraft (App Preview).